NOTE: This battery is for use in waterproof cases. For everyday use please order zinc-air implant batteries. Zinc-air batteries require air to generate power. Some cochlear implant processors can be inserted in a waterproof cases, however, there is insufficient air inside the case for the zinc-air battery to generate sufficient power. This is where alkaline batteries of the equivalent 675 size battery can be handy. LR44 alkaline batteries are the same size as the zinc-air size 675 batteries. These batteries can be used in cochlear implant processors whilst in a waterproof case. It should be noted that the life of LR44 alkaline batteries is considerably less than that of a 675 zinc-air battery, but will perform in an airtight situation. The performance and life of the alkaline battery will vary from processor to processor depending on the map. 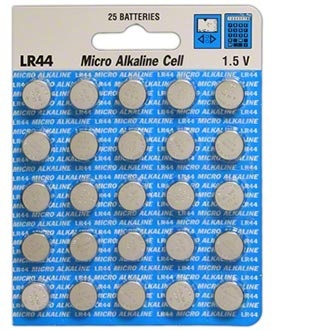 The LR44 battery is less expensive than silver oxide equivalent batteries and usable with a wide variety of equipment, ranging from electronic calculators to electric toys. The LR44 battery boasts high quality and high reliability. LR44 replaces the following battery types: 157, A76, AG13, G13A, GPA76, KA76, L1154, PX76A, PX76AB, RW82, SB-F9, V13GA.